Frisbee came to Carleton in the 80's through a vibrant intramural program. Teams were required to play 5-2 co-ed, and in the mid-80's, a women's team was formed called The Marines to advertise with the U.S. Marines recruiting campaign, "We're looking for a few good men." While there was some entry into tournaments, in fall 1986, both the men and the women were ready to take the team to the next level and create a competitive program. Al Duerr '88 led the charge for the men, who are now called CUT, and Betty Byrne '88 and Pam Kraus '88 led the women. They made a friendly wager as to who would make it to Nationals first. In the spring of 1988, the women won the bet. Playing under the name The Marines, the Carleton women competed at Nationals in Santa Barbara, CA. In the spring of 1989, the team began exploring new names. Laura Goering, a Carleton Russian professor and teammate back when professors were allowed to play, suggested the name Syzygy. The astronomical term meant the alignment of three heavenly bodies, based off the dominant offensive strategy at the time split between handlers, middles and longs. The team voted the name in, and Laura wrote the Syzygy rap, sung before games to this day. Armed with a great name, great cheers and a great team, Syzygy made its first trip to the semifinals at Nationals in Wilmington, NC. In the early 90's, the team continued to successfully compete at Nationals each year and advanced to the semifinals several times. The success of women's ultimate at Carleton began attracting more women players, and the rise in demand also spawned a new women's team called Eclipse. In the mid-90's, Syzygy continued to find success at Nationals, but the top-spot remained elusive. Syzygy returned to the semis of Nationals in the spring of '96 and '97. Then, in the spring of 1998, Syzygy broke into the finals for the first time. Team members from this era went on to form the core of some of the best women's elite club teams in the country. Syzygy’s repeat appearances in the finals in 1998 and 1999 would finally earn them their first National Championship in 2000 in Boise, Idaho. After the Nationals title, the team spent a few years back out of the top four, and one year for the first time since making Nationals in 1988 missed qualifying. Competition was getting stiffer across the country, but despite the results, the team was slowly rebuilding. In 2004, the team bounced back to a second place finish. After their finals appearance in 2004, Syzygy continued to consistently qualify for Nationals. And in 2013, an extraordinarily deep team reemerged as a Nationals finalist. 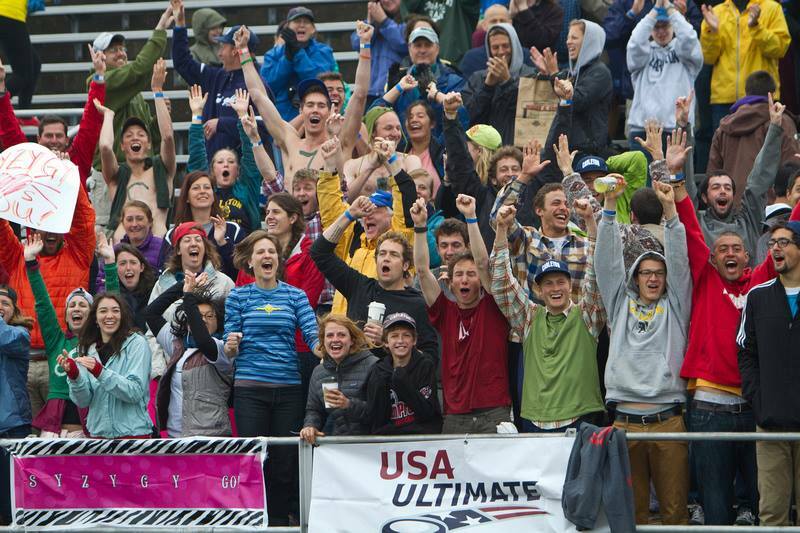 By now, ultimate had expanded from college levels into high school and even a handful of middle schools. The combination of ultimate players who began playing at a very young age, varsity athletes from other sports, and talented rookies created a lot of depth and paved the way for a successful season. Syzygy made their first appearance on ESPN3 in the semis and finals games in Madison, WI. For the first time ever, Carleton alums, alums' ultimate-loving kids, parents, friends and new converts from around the country cheered the team on to a second place finish. ​Building off of years and years of hard work, the current Syzygy team strives to continue in this path of excellence and represent the drive, spirit, and energy of the generations that have come before us each time we step on the field. S-Y-Z-Y-G-Y GO!